There are a ton of game jams happening online at any point during the year. Many of these jams follow a theme and a timeframe, giving developers the challenge of creating a game within a specific jam’s restrictions. I am able to record loads of these games for each and almost every game jam. As I record them all, I pick out games that stand out to me and games I love from each individual jam. This article contains the games I love from the the Wizard Game Jam 6. Developers were challenged to make a game based on an Idle Thumbs podcast. I’ve played through each of the submitted games in my compilation video series and below are a few of my favorites, in a random order. This stunning adventure game wakes you up in a ruined prison, telling you that you have been asleep for too long. The world around you has started crumbling and you can’t remember much of what’s going on. There are tons of new things in this world — languages you can barely remember and floating lights that look a lot like words. You need to explore around and see if you can find your home. As you slowly explore the environment, you come across puzzles. Some of them are quite easy, while others require a bit more of a challenge. The game itself is quite slow-paced, allowing you to relax and listen to the music as you explore the strange world. Its music adds to the atmosphere — one that is mysterious and slightly creepy — as you explore. The world is empty, nearly haunted, and you seem to be the only person who survived. Maybe it’s best that you slept too long. Ping sees you taking control of a submarine, in charge of finding and firing missles out at enemies in the sea. This challenging game puts you in a very small space, surrounded by windows, buttons and dials. You can look through various portholes, ping sonar signals out around you, then fire missiles at targets you have locked onto via the tracer at the bottom of the ship. As the entire game takes place inside this ship, you need to keep moving around and checking out the portholes to really see beyond. Ping is very much a challenge — discovering the various enemies and being able to accurately target them does take some learning — but once you have it, you can really destroy everyone, even if they aren’t in sight. 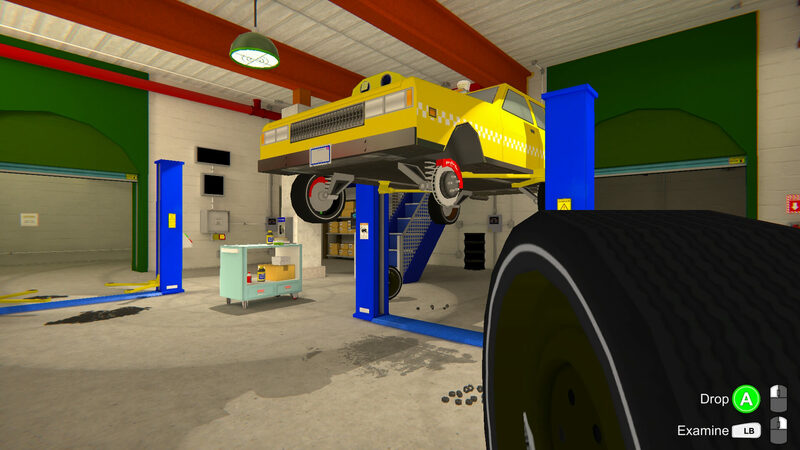 Get Hoisted is a really fun management game where you are a mechanic, trying to get a taxi cab up to the right state to be driving on the road. As you know, taxi cabs can’t really work when they are in the shop, so you are expected to change everything that’s needed as fast as possible. You are given a diagram showing what needs to be done to the car; tires that need to be changed, licence plates changed, cameras cleaned. You must then fulfill the order before pressing a button to see if you did everything correctly. Get Hoisted also has achievements to aim for as you get more into the game. Cars start to come in with more and more stuff to be done, so you need to work fast and efficiently.